The Grammy Award-winning folk rock quartet performed for more than 22,000 devoted fans on a warm autumn evening overlooking the Atlanta skyline. 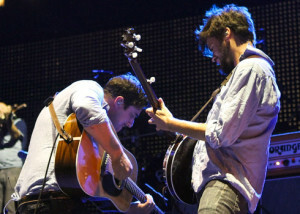 Mumford & Sons brought their distinctive acoustic sounds, vocal harmonies, and chart topping singles to Centennial Olympic Park as part of their “Gentlemen of the Road” tour, with support from The Vaccines and Bear’s Den. The band interacted with fans throughout the evening and seemed genuinely pleased with the atmosphere, venue, and especially the energy of the crowd. The night’s set came to a close with a three-song encore capped off with a cover of “Come Together” by the Beatles. 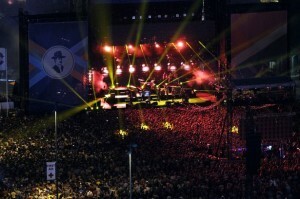 The festival-size concert on Tuesday, September 10th marked the band’s third outing in Atlanta. The first was in 2010 when they played the 1,500 capacity venue now known as the Buckhead Theatre. After winning several Billboard Music Awards, and the hearts of fans and critics alike, the band returned in 2011 to play to a much larger crowd at the iconic Fox Theatre. The four-piece band from Britain have been steadily climbing the ladder of success since their inception in 2007, and won Album of the Year for their 2012 release ‘Babel’ at this year’s Grammy Awards. Mumford & Sons have become an international sensation, and are one of the main driving forces behind the genre skyrocketing into the mainstream. It’s always refreshing to see a band with such talent and originality also provide a gratifying live experience for their fans. We look forward to working with everyone involved again!